On January 27th of this year The New York Times published a scathing editorial, cleverly disguised as a “news article”, trashing Trump for saying that something was rotten in Brussels. The NYT, and the offended countries should now admit that they should have taken Donald’s warning seriously, not as a insult to their egos. Today, they paid the price. LONDON — He incensed Paris and London by saying that some of their neighborhoods were so overrun with radicals that the police were too scared to enter. He raised Scottish tempers by threatening to pull the plug on his investments there, including his luxury golf courses, if British politicians barred him from entering Britain. Asked by the Fox Business Network anchor Maria Bartiromo about the feasibility of his proposal to bar foreign Muslims from entering the United States, Mr. Trump argued that Belgium and France had been blighted by the failure of Muslims in these countries to integrate. Warming to his theme, he added that Brussels was in a particularly dire state. “You go to Brussels — I was in Brussels a long time ago, 20 years ago, so beautiful, everything is so beautiful — it’s like living in a hellhole right now,” Mr. Trump continued. For Belgians, already reeling from recent terrorist plots and a chronically dysfunctional government, Mr. Trump’s words were enough to induce a fit of pique worthy, in some cases, of Mr. Trump himself. Before long, the hashtag #hellhole was gaining traction on Twitter as Belgians lashed out at Mr. Trump, deploying an arsenal of insults, irony and humor, including images of Belgium’s beloved beer and chocolate. One Twitter user posted a picture of Mr. Trump with what appeared to be a Belgian waffle stuffed in his mouth. “This is my hellhole,” Joseph Lemaire, a Brussels-based public relations consultant, posted on Twitter, along with several photos, including one showing the capital’s central square, the Grand Place or Grote Markt, which is flanked by stately 17th-century buildings from the city’s prosperous mercantile days. Another Twitter user, called BerlayCat, posted an image of a gang of cats playing the drums in the Grand Place. “This is not Brussels hellhole,” the user wrote — a reference to “This Is Not a Pipe,” the title of a painting by the Belgian Surrealist master René Magritte. A Twitter user using the name Berlaymonster (Berlaymont is the headquarters complex of the European Commission in Brussels) posted what appeared to be a modified version of the Wikipedia entry for Dante’s “Inferno.” The list of chapters showed Limbo, Lust and Gluttony. The fourth chapter? Brussels. 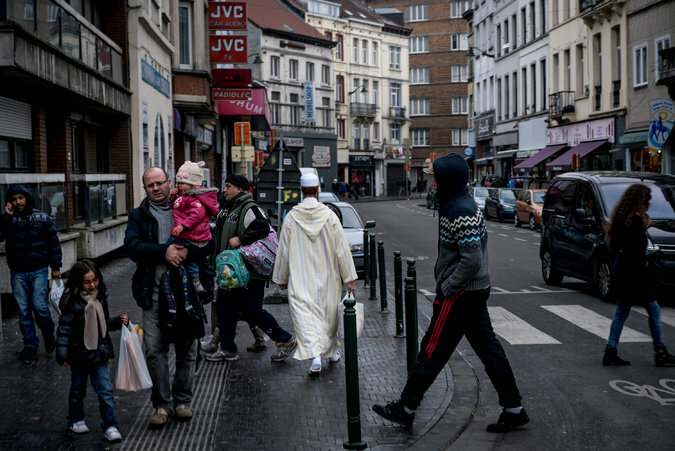 Belgium has come under scrutiny for failing to tame growing radicalization. Éric Zemmour, a French writer, recently suggested in an interview that rather than bombing the Islamic State’s self-declared capital of Raqqa, Syria, France should bomb Molenbeek, the working-class district in Brussels where several of the Paris attackers lived. Rudi Vervoort, the president of the Brussels region, said through his spokeswoman that he was surprised by Mr. Trump’s words. “We can reassure the Americans that Brussels is a multicultural city where it is good to live,” said the spokeswoman, Leonôr da Silva, listing the city’s virtues: green spaces, a tolerant culture and its central place in Europe. Jean-Philippe Schreiber, a historian at the Université Libre de Bruxelles, said Mr. Trump was stirring up xenophobia. Brussels has its problems, he added, but Mr. Trump’s “hyperbolic” comments were not worthy of a response. Indeed, Belgians could be forgiven for their sense of wounded pride. First, there is the beer, the galaxy of Michelin starred-restaurants, and a thriving design and art scene. Brussels also hosts its beloved Manneken Pis, a 17th-century bronze statue of a little boy urinating. Channeling Mr. Trump’s provocative swagger, Mark Meirsman, a Belgian who works for the European Parliament, but who emphasized that he was writing in his personal capacity, wrote on Facebook that Mr. Trump should stand next to the Manneken Pis the next time he finds himself in Brussels (though not, Mr. Meirsman stressed, as president). NO CAREER POLITICIAN, ESPECIALLY A GLOBALIST LIKE TED CRUZ, WILL FIX THIS PROBLEM! ONLY DONALD TRUMP CAN!